Project is a 10,000 sq. 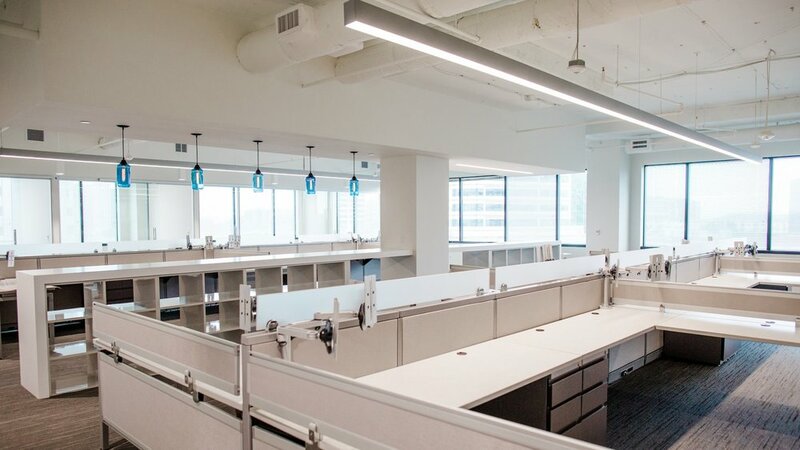 ft. fit-out for the law office of Studebaker & Brackett in West Mclean, VA. DesignTech collaborated with Form Architects on this project which included mechanical, electrical, fire alarm, plumbing, and fire protection design services. Mechanical design included new low pressure supply air ductwork distribution and air devices from the existing fan-powered and shut-off VAV terminal units. Scope also included acoustically minded design practices for the reduction of fan noise in the no-ceiling areas and prevention of voice sound transfer from private offices. In the open office spaces, soundlined return duct elbows were added to the inlet of each fan powered VAV and in the private offices, low velocity soundlined transfer air ducts were added to address these noise concerns. The IT spaces are served by a new thermostatically controlled exhaust fan which provides after-hours temperature control. Electrical design included new high efficiency LED lighting and occupancy controls in accordance with energy conservation codes. Scope also included power connections to new eight wire systems furniture. These connections required specification for ground penetrating radar scans prior to core drilling and installation of fire-rated poke-through devices. Power connections were also designed for connection to mechanical and plumbing equipment. Fire alarm design included notification appliances and control modules for interface between fire alarm system and electrified mortise locks. Plumbing design included a new tank water heater with water leak detection to close water supply, garbage disposal, and water connections to a bottle fill fixture, and the refrigerator. Scope also included sanitary and water connections to a new pantry sink. The garbage disposal featured an countertop mounted air switch accessory to eliminate any switches or outlets on the pantry wall. The air switch is non-electric and therefore waterproof.